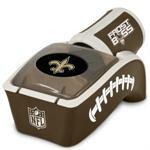 The newest and coolest way to turn your can of warm beer or soda into a frosty beverage! It's portable and can chill a can to 38 degrees in two minutes! Like having a "reverse microwave" - a tailgater's dream when the cooler runs empty!